Astronomers working as part of the European Southern Observatory (ESO) at the Cerra Paranal Mountain Observatory in the Atacama Desert in Chile, have succeeded in virtually connecting all four main Unit Telescopes (UTs) at the site, completing a project ten years in the making. Connecting the telescopes together virtually allows for the creation of a single virtual mirror that allows researchers to capture images from space as if all of the telescopes were in fact one giant telescope with a mirror 130m in diameter. Combined, the telescopes are known as the Very Large Telescope (VLT). A new Very Large Telescope (VLT) image of the Antennae Galaxies above gives us a stunning visible-light view of this striking pair of colliding galaxies with dramatically distorted shapes that takes its name from the long antenna-like "arms" extending far out from the nuclei of the two galaxies. 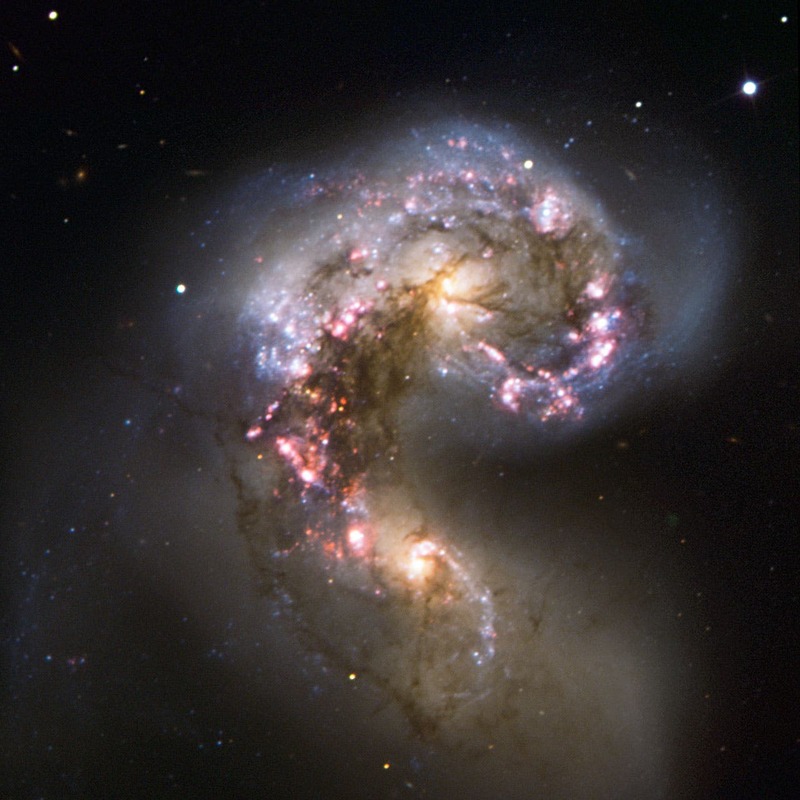 This VLT view focuses instead on the galaxies’ nuclei, where the real action is taking place as the two galaxies merge into a single giant galaxy. Spurred by shock waves created by their gravitational wrestling, the two galaxies have become dotted with brilliant blue hot young stars in star-forming regions, surrounded by glowing hydrogen gas, shown here in pink. The two pale yellow blobs are the cores of the original galaxies, shining with the light of old stars and picked out by delicate lanes of dust. ALMA –the Atacama Large Millimeter/submillimeter Array– which has just started its Early Science observations. ALMA , constructed by ESO and its international partners, observes the Universe in light with millimetre and submillimetre wavelengths — radically different from visible-light and infrared telescopes. ALMA’s view is the best submillimetre-wavelength image ever made of the Antennae Galaxies, despite being just a taster of what ALMA will deliver. The ALMA image was made using test data from only twelve antennas, and as the observatory grows, the sharpness, efficiency, and quality of its observations will increase dramatically. This image was processed by ESO using the observational data found by Alberto Milani (Italy), who submitted it to ESO’s "Your ESO Pictures" Flickr group.